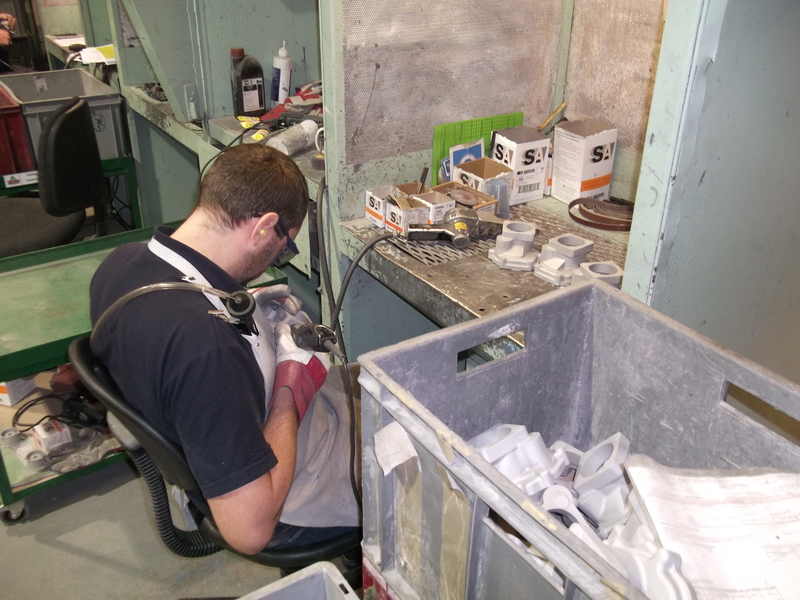 In foundries, once the casting is removed from the mould it is usually necessary to remove excess metal and remedy defects. This process is usually referred to as “fettling” or “finishing”. Fettling normally involves the use of powered hand tools such as chippers and grinders. The operation presents a number of significant risks. Using power tools exposes the workers to high noise levels and hand-arm vibration. There is also a risk from exposure to the dust generated by the process. The dust will largely consist of metal particles, but this is usually of low toxicity. The main concern occurs where sand is used for the moulds in which the metal is cast. This is crystalline silica. Some particles of sand from the mould adhere to the metal and grinding during fettling can lead to the release of fine dust including particles of respirable crystalline silica. “Respirable” particles are smaller than 10 microns in diameter and can reach the deepest regions of the lung. Regular, repeated exposure to respirable crystalline silica can lead to silicosis, a serious, debilitating lung disease. Respirable crystalline silica has a very low Workplace Exposure Limit of 0.1 mg/m3 as respirable dust. In fact, as the above chart shows, long term exposures to concentrations much lower than this can lead to some workers developing silicosis. There is also evidence that prolonged workplace exposure to crystalline silica can lead to an increased risk of lung cancer, although this is only likely to occur in those workers who have already developed silicosis. Given the nature of the risk exposures need to be reduced as low as practicable. So, it’s important to ensure that the dust generated during fettling is properly controlled, particularly when there is a risk of exposure to silica. In most cases, the most practical and effective way of doing this is to install well designed local exhaust ventilation. The Health and Safety Executive have developed a number of sheets providing practical advice on how to control dust and fume generated during foundry processes, including fettling. For small castings they recommend the installation of an extracted booth. The work is carried out inside the booth which then contains the dust generated allowing it to be removed effectively by the extraction. 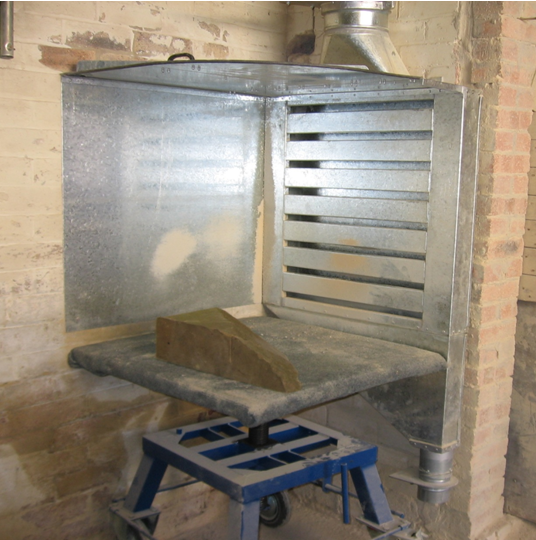 Recently, one of our consultants was carrying out a survey in a foundry. They had installed this type of booth for their fettling operations. However, as can be seen in the following photograph, The booth was not being used in the way intended – the worker was carrying out the work outside the booth. The dust generated was not contained and, consequently, the extraction would not be as effective as it should be. 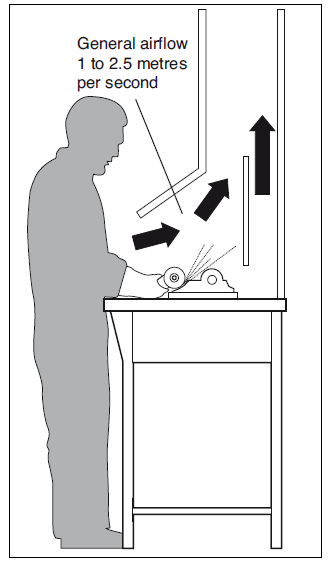 The worker will have a higher exposure than if he carried out the fettling inside the booth. In a previous post I outlined the key steps needed to control health hazards in the workplace. The first steps are recognising that a risk exists and then making sure that appropriate, effective controls are specified, designed and implemented. In this case the risk from dust exposure was recognised and a local exhaust ventilation system with an appropriate hood design was installed. The problem is that it is not being used properly, considerably reducing its effectiveness. Once controls have been implemented they need to be properly managed to ensure that during use they continue to do the job they were designed to do. This requires training, supervision, maintenance, testing, audit and review. It’s a management responsibility to ensure that controls are properly used so more vigilant supervision seems to be required. In this example, there could be a number of possible reasons why the booth was not being used correctly. Perhaps management and the workforce don’t fully understand the health risks and so don’t appreciate the importance of using the controls properly. Perhaps the workers haven’t been properly trained on how to use the booth. However, there could be a problem with the design of the booth. It is possible that carrying out the work inside the enclosure presents the operator with some practical difficulties. Perhaps the fine work required is difficult to complete properly if the casting is inside the booth or the booth dimensions, particularly the height, could cause the worker to adopt an awkward posture which causes discomfort and could lead to musculoskeletal problems. Solving one problem often creates another. Ergonomics is often neglected when designing engineering controls for chemical hazards. Ideally workers need to be consulted and involved in the specification and design of the controls and its good practice to build and test a prototype before finalising the design. Proper commissioning of the controls should also check for usability. Further investigation would be required to get to the root cause of this problem. However, the case illustrates the importance of proper management of the design, implementation and use of controls. 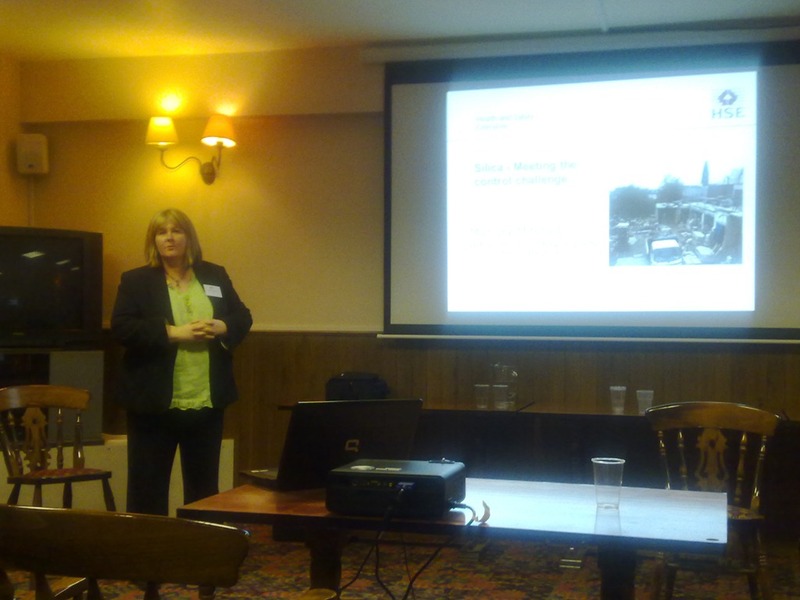 On Wednesday 9 March I attended a meeting on “long latency disease” organised by the BOHS North West Region. I guess the subject wouldn’t mean much to many people. In fact it simply means diseases that take a long time to develop following exposure to hazardous substances. This includes diseases such as cancer caused by asbestos and other chemical agents and respiratory diseases such as silicosis, chronic obstructive pulmonary disease (COPD) and asthma. The meeting was chaired by Alex Bianchi (ExxonMobil), BOHS President Elect. 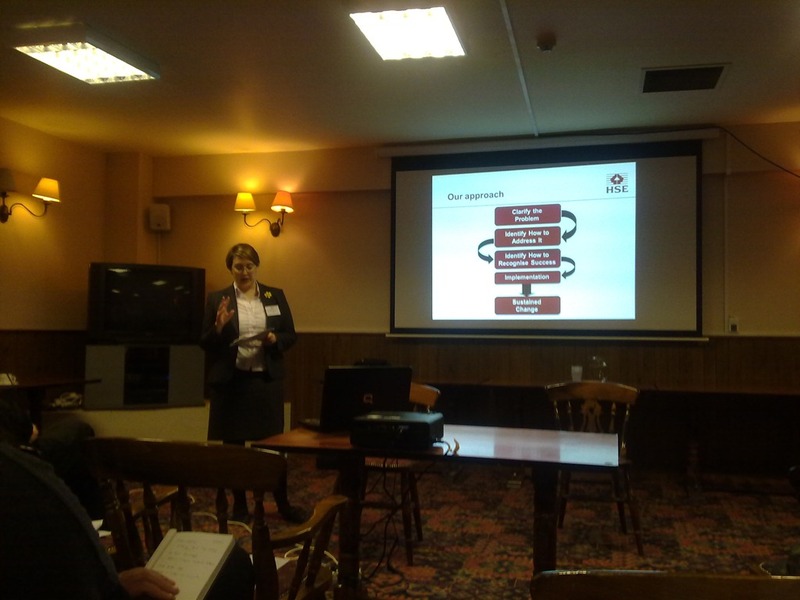 Alex also spoke about a number of issues relevant to BOHS Members, including the BOHS strategic review, the new Occupational Safety and Health Consultants Register, BOHS’s International Partners scheme and the new Associate Grade Membership of the Faculty of Occupational Hygiene. The first speaker was Rachel Beattie of the Health and Safety Executive (HSE) who spoke about their approach to addressing Long Latency Disease., using their campaign on asbestos as an example. Currently there are 4000 people die every year in Great Britain due to past exposure to asbestos. About 1,000 of those are tradesmen such as electricians and plumbers and HSE’s research suggested that many of them still didn’t see asbestos exposure of something of concern and even where they were aware of the risks, they didn’t know how to protect themselves. The campaign focused on delivering simple, hard hitting messages via media relevant to the target groups. Rachel emphasised the need to embed changes in attitude and behaviour, recognising that this was a lengthy process. There are no “quick fixes”. 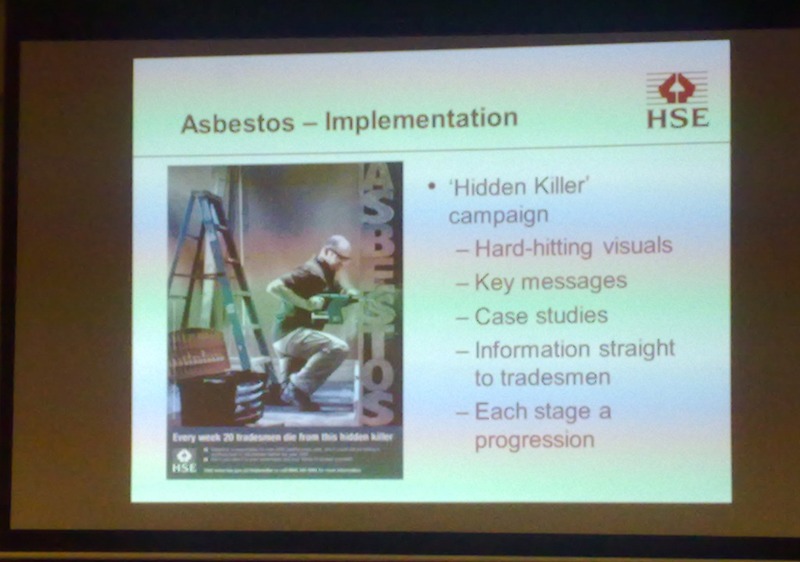 There was some debate about whether the messages were still relevant given that the exposure of tradesmen to asbestos working on buildings were considerably different to those experienced 30 or 40 years ago. Today they should not be working directly with asbestos as they would have in the past. The main way they would be exposed today would be by accidentally disturbing asbestos containing materials in the building fabric and the best way to address these risks is to ensure that the materials are properly managed by the owners of the buildings. The question was raised as to whether the HSE’s campaign was misdirected and that it was more relevant to ensure that building owners fulfilled their obligations. An interesting and valid point, but, with limited time available, it wasn’t possible to explore it properly. Chris Keen of the Health and Safety Laboratory (HSL) – spoke about his work on a joint HSE/HSL project to developing the evidence base for exposures to carcinogens in the workplace. 32 substances that are known or suspected carcinogens (not including asbestos) were investigated using biological monitoring as the main exposure tool, supplemented by air sampling. Extensive surveys, in many cases involving large numbers of samples, were carried out in a number of target industries, in most cases working in partnership with industry groups. Concentrating on a number of specific industries, including plastics, the use of MbOCA in polyurethane production, the chemical supply industry, surface finishing (better known as electroplating) and foundries, Chris provided outlines the types of exposures they’d found and was able to provide some examples of where companies had been able to reduce exposures as a result of the intervention. Although the project is mainly intended to increase the information available to the HSE, the findings from many of the surveys are being published so that they will be available in the public domain. It was interesting to hear how biological monitoring had been the main technique used to evaluate exposures rather than air sampling. Measuring the concentration of the contaminants or their metabolites in blood, breath or urine is probably the most accurate way of assessing exposure as it evaluates what is actually absorbed by an individual and considers all routes of exposure. Air sampling can only measure the concentration in the breathing zone; it can’t accurately assess what is taken into the body which depends on factors other than the concentration in the air. It also can’t take into account exposure that may occur via skin absorption and ingestion. Yet air sampling is the main approach normally used in occupational hygiene surveys. So Chris’ presentation certainly raised some food for thought. However, as Chris pointed out, air sampling can still provide useful supplementary information – helping to identify routes of exposure and with the specification of controls. In her talk on “Controlling Exposures to Silica at Stonemasonry“ Marjory Mitchell an Occupational Hygiene Specialist Inspector with HSE, showed how a small stonemasonry company had modified and improved their local exhaust ventilation system to improve control over the dust generated during the cutting of blocks of stone. 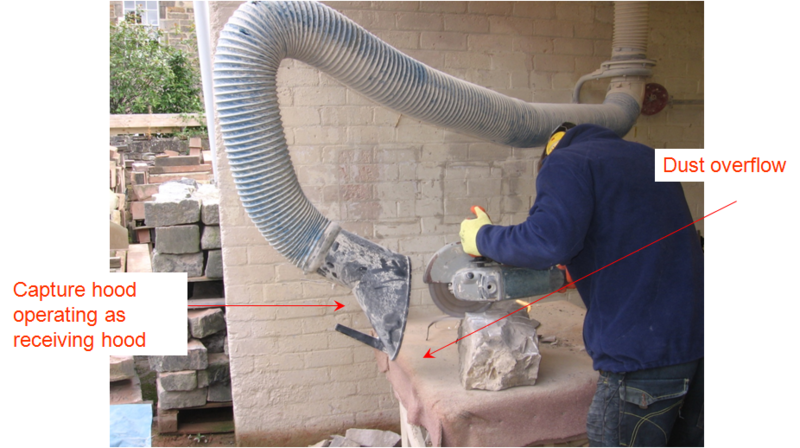 High exposures to respirable crystalline silica, which can cause silicosis, a serious lung disease, and which is also associated with lung cancer, can occur during stonemasonry processes. A good standard of control is needed to minimise the risks to health. The original system had a flexible arm hood, which, as is often the case when these systems are used on dust generating processes, was largely ineffective at controlling the contaminants. A new hood, a partial enclosure with receptor characteristics, was constructed and installed and, while not perfect, substantially increased the degree of control. 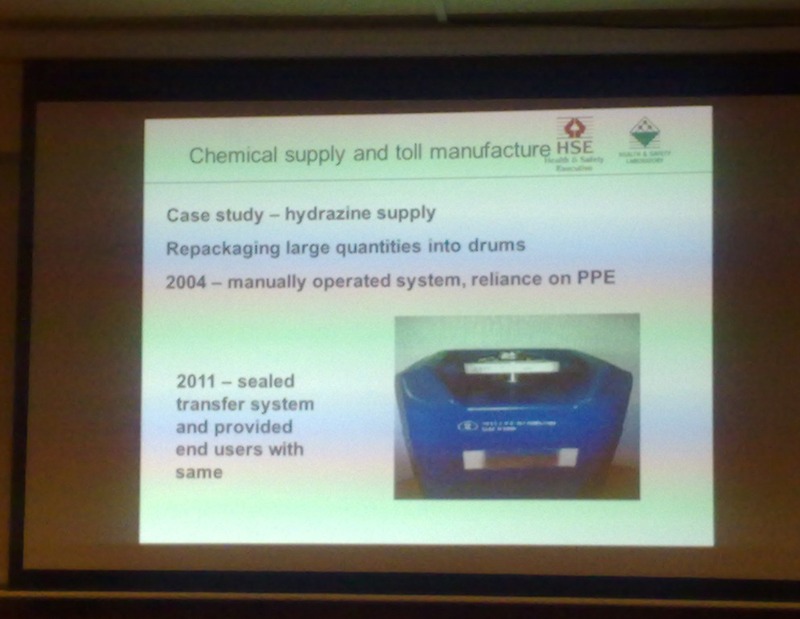 The case study provided a good illustration of how by applying the principles set out in HSE guidance, exposure to hazardous substances can be reduced. 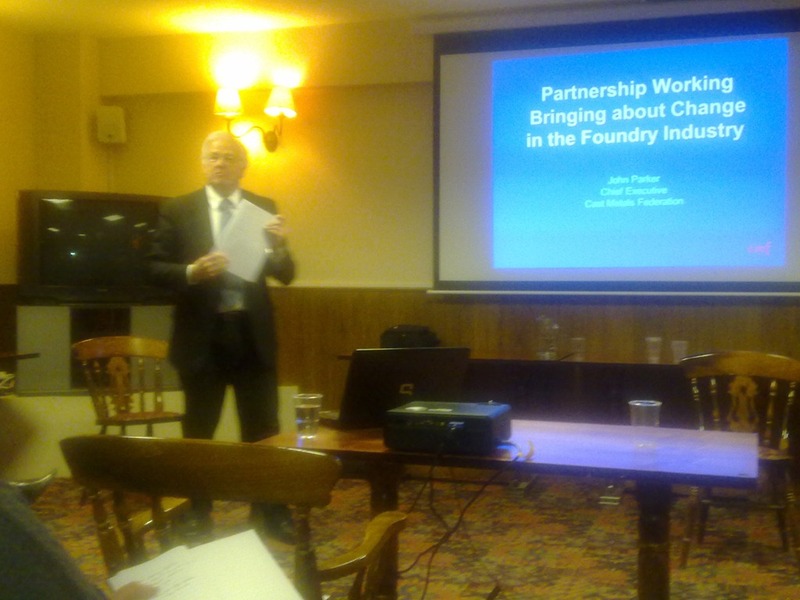 The final speaker was John Parker, Chief Executive of the Cast Metals Federation, who spoke on “Partnership Working Bringing about Change in the Foundry Industry”. 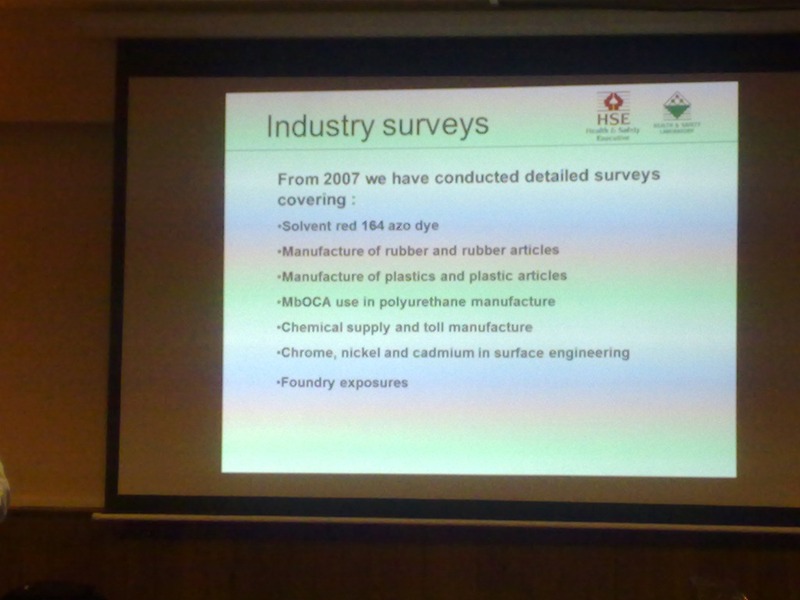 The foundry industry had participated in the HSL/HSL project that Chris Keene had described in his earlier presentation. John talked about the types of chemical hazards created by foundry and gave an overview of the objectives and deliverables of the foundry industry’s collaboration with HSE. He ended his talk by saying that “the cast Metal Federation, through its partnership with HSE, is committed to bring about change in the UK foundry industry” . Are the Tate’s sunflower seeds a risk to health? No details have been provided on the risk assessment that led to this decision, but it appears that the seeds can be crushed underfoot generating dust that could become airborne and then inhaled. What could this dust consist of? Although no exact details are available on the composition of the seeds, porcelain is made from a number of materials that contain crystalline silica. Respirable particles of this common mineral can cause “silicosis” – a serious, debilitating lung disease, where scar tissue is deposited in the lungs reducing their ability to transfer oxygen into the blood and leading to other complications such as emphysema. For the condition to develop exposure has to occur over a long period of time. A single, brief exposure won’t lead to any harmful effects. A quick search of the literature throws up quite a lot of information on the risk of silicosis during porcelain manufacture, when workers would be exposed to the raw materials, but there does not appear to be much on the hazards presented by inhalation of dust from fired porcelain. Some free crystalline silica is likely to be present, but only as one constituent, and it’s unlikely that all of this will be respirable. So some of the dust generated by people walking over the seeds may be hazardous, but what really matters is the risk to health. This is determined not only by the hazard, but also the exposure to the dust, which depends on the concentration and the duration and frequency of exposure. Even if all the dust did consist of respirable crystalline silica, I think that it is unlikely that the risk to visitors would be significant. Its difficult to estimate what the dust concentration would be, but as the Tate themselves state, the dust “could be damaging to health following repeated inhalation over a long period of time”. 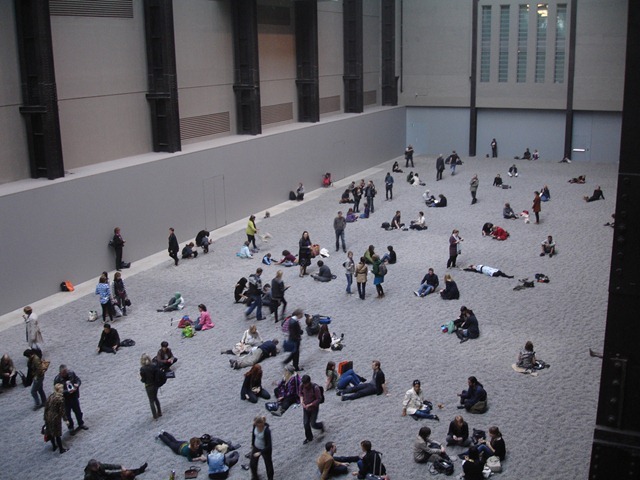 Most visitors from outside London are probably only likely to visit the exhibition once and would perhaps spend a couple of hours in the Turbine Hall. Even if the concentration of crystalline silica was above the Workplace Exposure Limit (which is probably unlikely) their exposure would not constitute “repeated inhalation over a long period of time”. Perhaps the concerns are for the health of the staff who work in the gallery (although that is not what the Tate are saying). They clearly would have a longer and more frequent exposure to the dust. The risk then, would depend on the concentration of the dust in the Turbine Hall. I don’t know whether the Tate have properly assessed this, but it would be relatively easy to monitor the dust levels to allow an informed judgement to be made of the risk. It is possible that there are other components of concern in the dust. The seeds are all painted and paint pigments can contain toxic materials. I would have hoped that the artist would have avoided using such paints due to the potential risks to the artisans who created the seeds for him. 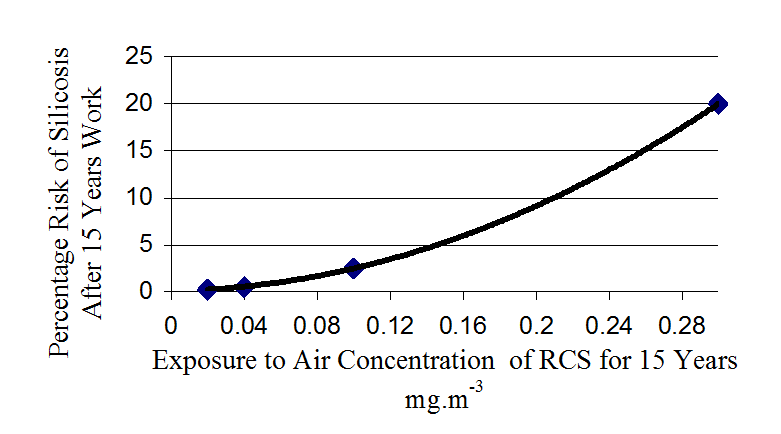 However, even if the pigments did include toxic components the same considerations would probably apply as for the respirable crystalline silica – i.e. the risk would be from repeated exposure to a significant concentration over a long period of time and, as with the silica, it is unlikely that this would be the case, certainly for visitors. It seems likely that the Tate have overreacted somewhat. I think the health risk to visitors due to exposure to any dust will be negligible. So this could be a case of “health and safety gone mad” or perhaps the Tate have other reasons for forbidding visitors from walking on the work.